The church is near the village of Moni in the area of Tragaia, Naxos. 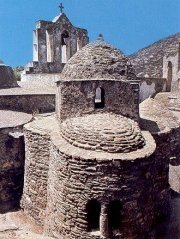 It is an Early Christian, tri-apsidal church with a dome. Three single-room chapels are incorporated along the northern side. The interior wall surfaces have wall paintings of various phases. The earliest layer of wall paintings, which dates to the end of the 6th and beginning of the 7th centuries has been revealed in the dome, the sanctum and in the northern apse. The latest layer on both dome and apse is datable to the 13th and 14th centuries; it has been removed from the wall. The church was probably originally the Katholikon of the Monastery. Later on, information about the Drosiane is given by the Duke of the Aegean Sea, Ioannes IV Crispos (1555) and others. In addition, benedictory inscriptions of the 6th and 7th centuries are preserved on the walls. The church was restored in 1964. Cleaning of the wall paintings and removal of the most recent layers has been carried out over the years 1964 - 1971.